RT1650 is a fully integrated wireless power receiver, intended for wireless power in mobile devices up to 7.5W. 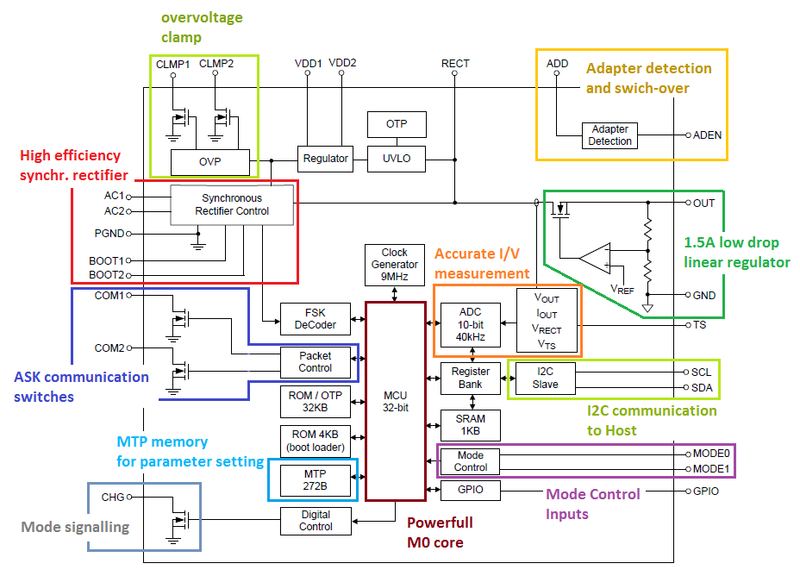 This application note explains basic principles of Wireless Power Transfer, Wireless Power standards and the Qi WPC1.1 low power standard, and describes the features of RT1650. Several system aspects of a WPC1.1 5W application are presented by means of a practical example which uses a Nokia DT601 wireless power transmitter and the Richtek Wireless power receiver RT1650 evaluation board. Absence of bulky connectors can reduce application size, which is great in wearable devices like Bluetooth headsets, smart watches and health (biomedical) devices. Contactless power transfer is convenient: It eliminates the need to plugging connectors in and out; just place the receiver device on the transmitter surface to start the power transfer. In most applications, wireless power transfer is used to charge the battery of a mobile device, hence the popular term “wireless charging”. Figure 1 shows some examples of several wireless power transfer applications. The most common method of wireless electrical energy transfer is via two coupled inductors by means of magnetic induction. An AC transformer is an example of this principle. Magnetic fields around a coil decrease exponentially with distance, which means that for efficient power transfer, the distance between transmitter and receiver coils needs to be relatively small, much less than the diameter of the coils. Considerable power levels can be transferred. 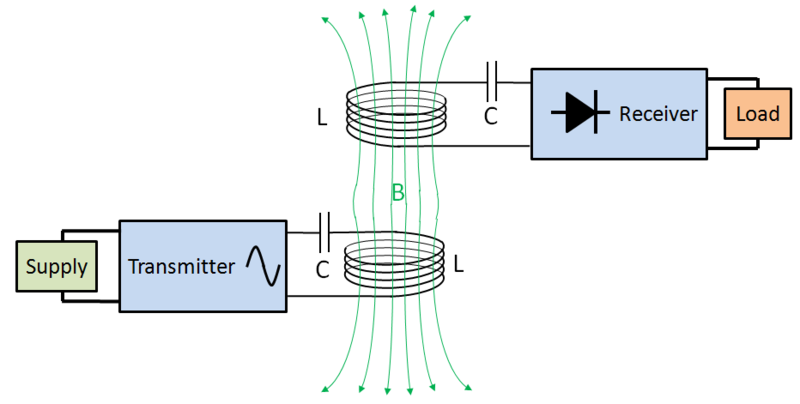 A method that allows slightly larger distance between transmitter and receiver coil is called resonant inductive coupling. In this system, both transmitter and receiver have resonant LC circuits tuned to the same frequency, and power is transferred at exactly this resonance frequency. The resonance between the two tuned coils will enhance coupling and improve power transfer. It allows slightly larger distance between transmitter and receiver coil, but the maximum transferrable power is lower compared to magnetic induction. With the increased use of portable devices that require regular charging (like cell phones, tablets and notebook computers), in 2008 the Wireless Power Consortium (WPC) was established with the aim of setting standards for wireless power transfer between devices. In 2009, WPC published the Qi Low Power standard, which makes it possible to transfer power up to 5W by magnetic induction between any Qi compliant devices. 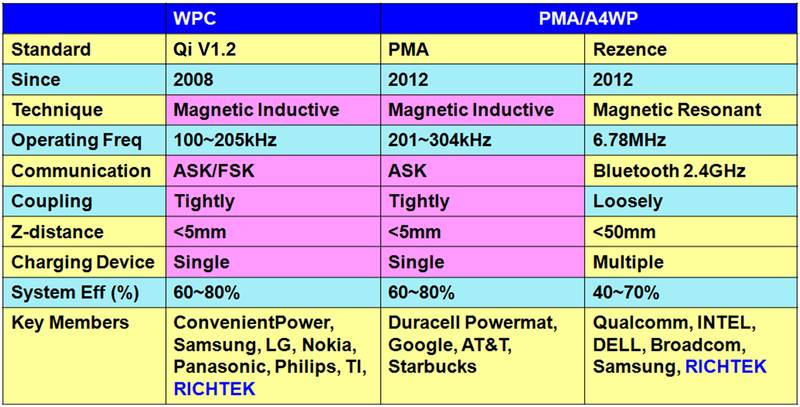 At present, there are three standards for wireless power transfer: Qi, PMA and A4WP. Qi and PMA make use of the same magnetic induction principle, while A4WP uses the resonant inductive method. Figure 4 shows the differences between these three standards. Performance wise, Qi and PMA are quite similar, allowing power transfer over short distances (typically around 5mm) to single receiver devices. Transmitter and receiver coils need to be relatively well aligned for efficient power transfer. Communication between the devices makes use of the same transmitted power signal, which avoids extra hardware for communication. There are some differences in communication protocol between Qi and PMA. Rezence (formerly called A4WP) makes use of Magnetic Resonant inductive coupling. This system can transfer power over slightly larger distances, up to ~ 50mm and the transmitter and receiver coils don’t need to be well aligned, at the expense of lower total system efficiency and reduced power transfer. The communication between receiver and transmitter is done via a Bluetooth link, which makes it possible to communicate between multiple devices, so the system allows multiple devices to receive power from one transmitter. The extra hardware for Bluetooth link makes this solution a bit more expensive. The Qi WPC1.1* low power standard (5W) is currently the most widely adopted method of wireless power transfer for mobile phones. *A new version WPC1.2 was released on June 2015. RT1650 receiver is compatible with WPC1.1 and WPC1.2 transmitters. The Qi WPC1.1 standard defines all the important parameters of the magnetic induction wireless power transfer system, like critical aspects of the power transmitter and receiver design, system control and communications interface. The basic block diagram is shown in Figure 5. The transmitter drives the transmitter coil with an AC signal while monitoring both AC voltage and current. The receiver coil is placed on top of the transmitter coil. By magnetic induction an AC voltage is induced in the receiver coil which then passes a rectifier stage to provide a DC output voltage. This voltage is then regulated to make it suitable for driving the application load. Output Power regulation takes place via a one-direction digital control loop, where the receiver continuously sends power demand signals back to the transmitter by means of backscatter; by modulating the received AC power signal. The transmitter demodulates and decodes these power demand signals and adjusts the coil drive signal to provide more or less power to the receiver. WPC1.1 defines several transmitter types, from fixed single coil systems, multiplexed multiple coil systems, to moving coil types that automatically position the transmitter coil for optimal power transfer. Power stages can be resonant half-bridge or resonant full bridges, and transmitted power adjustment can be done either by increasing or reducing the AC signal amplitude or by changing the AC drive signal frequency. In low power standby mode, the transmitter sends out regular “analog pings” with a certain AC frequency to check if a receiver is present or not. If a receiver is placed on the transmitter coil, the transmitter will detect coil loading or a slight change in resonance of the power stage, and subsequently switches over to digital pinging. (Note that some transmitters like Nokia DT601 don’t use analog pings, and only use digital pings for receiver detection). The digital ping from the transmitter has sufficient energy to activate the receiver communication section, which then can respond by modulating the digital ping signal with a Signal Strength packet. Upon successfully reading the Signal Strength packet, the transmitter maintains the power signal to move the system to the next phase. In the identification and configuration phase, the receiver sends data packets to the transmitter that contain the receiver WPC version and other configuration information such as maximum required output power. After completing the configuration phase, the system moves to the power transfer phase. Now the receiver measures the rectified voltage and sends Error Packets that tell the transmitter to increase or decrease its transmitted power. The aim of the receiver Error Packets is to control the transmitted power in such a way that there is sufficient voltage available at the receiver rectifier output for the post regulator to maintain a stable application output voltage. In addition, the receiver will regularly send a Received Power Packet to the transmitter. If the transmitter detects a too large difference between this Received Power value and its own transmitted power, it will shut down the system. This is done to ensure safety during power transfer; possible foreign (metal) objects on the power transfer pad could be heated by partial stray fields which would lead to hazardous situations. If the receiver no longer needs any power, (i.e. the application battery is fully charged), it sends an End Power Transfer packet, and the transmitter will enter a low power standby mode. The WPC communication flow is shown in Figure 6. RT1650 is a highly integrated and flexible wireless power receiver with an on-board MCU and MTP memory. With default firmware, it is compliant with the WPC1.1 low power standard. In this mode, it provides output power up to 5W. With some firmware changes, RT1650 can also work in WPC1.2.0 Medium Power configuration, and output power can go up to 7.5W. The maximum output power can be programmed by different values in the MTP memory. RT1650 can also be configured to support the PMA standard. RT1650 includes a high efficiency fully synchronous rectifier stage, and a low drop 1.5A linear post regulator stage. A special headroom control system regulates the LDO headroom for optimal balance between transient response and system efficiency. An on-board 32-bit ARM-Cortex-M0 MCU handles all WPC communication, system monitoring and fault detections and provides an I2C bus and programmable GPI/O pin for communicating with the host. In addition to ASK communication from receiver to transmitter, RT1650 also supports decoding FSK (Frequency Shift Keying) communication from transmitter to receiver, which can be used for identifying (medium power) transmitters, and decode extra messaging from transmitter side. High accuracy 10-bit ADCs are used for measuring received voltage and current, and a special algorithm is used to calculate receiver power loss, for accurate Received Power reporting. RT1650 supports both adapter input and wireless power transfer input. Two MODE pins can be used to disable or enable specific inputs. Other features include NTC temperature sensing, programmable IC temperature control and operation mode signaling. RT1650 comes in a small but thermally efficient 3x3.5mm 48B CSP package. 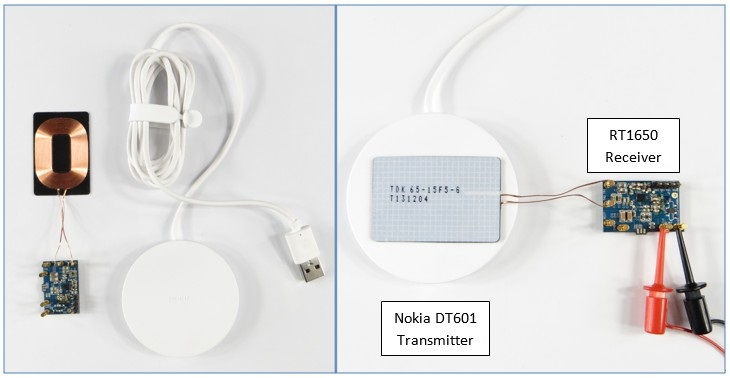 The working of a typical 5W wireless power transfer application is illustrated by the example below which shows a combination of the Nokia DT601 transmitter and the Richtek RT1650 receiver. The Nokia transmitter has 5V input, and is defined as WPC A11 type. Both transmitter and Receiver comply with WPC1.1 low power (5W) standard, have small form factors and are cost effective solutions. Although WPC1.1 is based on magnetic induction, both transmitter and receiver make use of series LC circuits tuned to the same 100kHz frequency, but the operation frequency lies above the series resonance. This is not the same as magnetic resonance operation where the operation frequency is equal to the LC resonance frequency, but it does offer improved power transfer compared to non-resonant coupled inductors. where L’S is the receiver coil inductance when placed on transmitter. For 100kHz resonance, C1 value should be 140nF, which can be obtained by three 47nF in parallel. where LS is the receiver coil inductance. In our example C2 should be 2nF. The total power transfer function from transmitter driving stage to receiver rectifier will show a resonance curve according Figure 10. 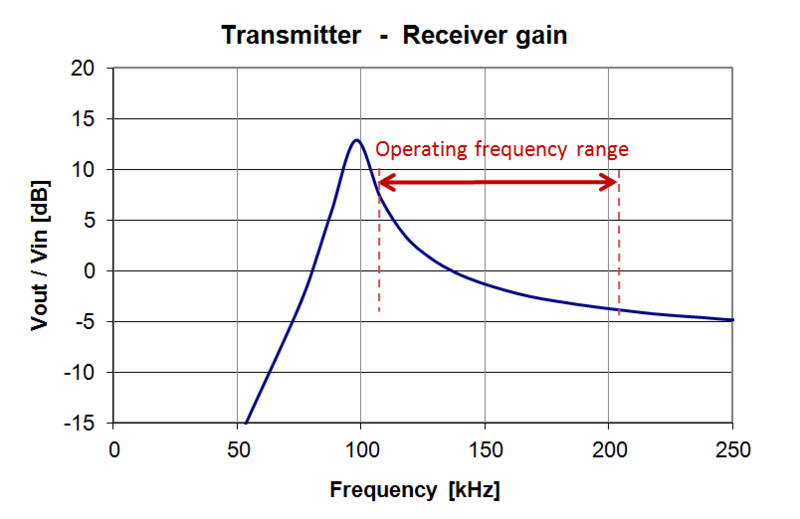 The A11 transmitter operating frequency can be controlled between 110kHz and 205kHz range, staying at the right side of the resonance. Due to the slope of the resonance curve, the receiver rectifier output voltage can be controlled by changing the transmitter power signal frequency. Note that the peak amplitude in the curve is dependent on the quality factor of the LC circuit. It is also load dependent. 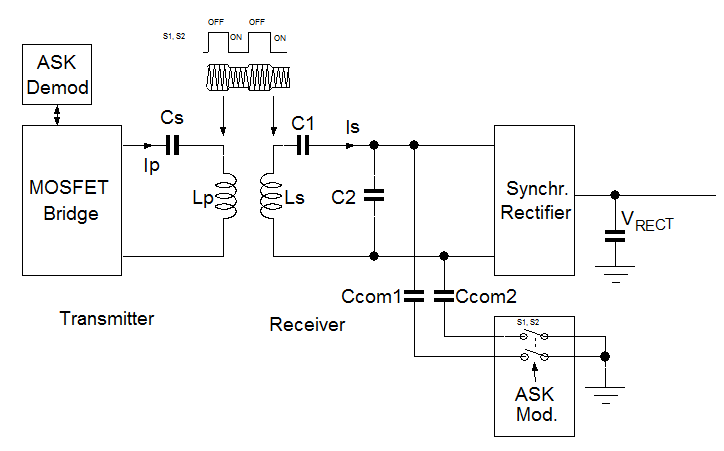 To ensure sufficient voltage gain between transmitter and receiver in all load conditions, the power stage components should be selected based on WPC1.1 requirements. WPC wireless power transfer systems should automatically activate the power transfer as soon as a receiver is placed on the transmitter coil. This means that the transmitter should continuously check for receiver presence in standby mode. These checks should be done with the least amount of power, to minimize the transmitter standby power consumption. 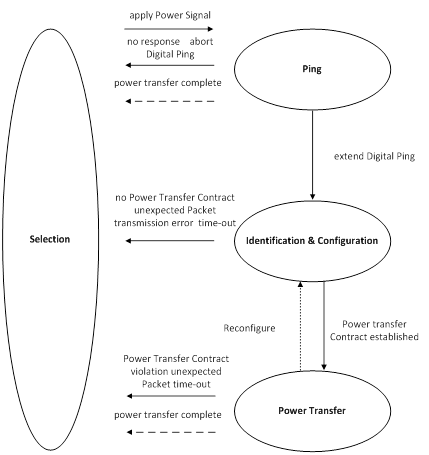 In the Nokia DT601 transmitter, receiver detection is done by sending out digital “pings” at regular intervals. The digital ping is a signal burst with enough energy to activate a receiver. Total average transmitter standby power without receiver present is around 70mW. If there is no receiver present on the transmitter coil, there is no communication back to transmitter and the transmitter stops the ping. As soon as a receiver is placed on the transmitter and the next digital ping is started, the receiver rectifier builds up sufficient voltage and the receiver communication is activated. (Communication activity is shown by the peaks in the rectifier voltage). The receiver starts communication with the transmitter for system initialization, and the transmitter remains active. See Figure 11. In WPC1.1, the receiver communicates with the transmitter via ASK backscatter method : the receiver will modulate the amplitude of the received transmitter signal. This amplitude variation is reflected back to the transmitter side, and is demodulated and decoded for processing. This change in AC signal amplitude is reflected back to the transmitter side. The transmitter then can detect the change in AC signal, either via voltage or current envelope detection, to demodulate the ASK information. From the waveforms in Figure 13, the basic behavior of the ASK modulation can be observed. Since this is a serial signal, it contains both clock information and data; the first part is a preamble for clock synchronizing, then a header, message and checksum. The signal transfer uses the differential bi-phase encoding scheme as shown in the figure below. The receiver measures the rectified voltage, output voltage and load current. It requests more or less power from the transmitter to allow sufficient headroom for the LDO to maintain well regulated output voltage. See Figure 14. At low loads, the rectifier voltage is set at a higher level, to allow more LDO headroom for sudden load steps. As average load is increased, less LDO headroom is needed and the rectifier voltage is reduced, with the benefit of less dissipation in the LDO at higher load currents. See Figure 15. The rectifier voltage will show a dip when a load step from light load to high load is applied. But due to the extra headroom at light load, the output voltage maintains regulated. Only at large load steps from zero load, a small dip in output voltage can be observed. RT1650 rectifier voltage setting over load can be programmed to cope with specific application loads and power stage output impedances. The dynamic system behavior will depend on transmitter supply stability. In transmitter systems powered from 5V supplies, this can be especially critical. The Nokia DT601 5V adapter will provide very stable 5V supply to the transmitter because the adapter has build-in cable compensation. When supplying the transmitter from a 5V USB output, the transmitter 5V supply will drop at higher load. In some cases, the regulation loop will recover, but when the receiver VRECT drops below the IC UVLO voltage at high loads, the system will shut-down and re-start. See Figure 16. In standby mode, transmitters will not react to metal parts placed on the transmitter coil. But when placing metal parts between transmitter and receiver coil during power transfer, this metal will be heated due to eddy currents generated in the metal. Without any safety measures, this metal could become quite hot, leading to unsafe conditions. The WPC wireless power transfer standard therefore includes an FOD check to detect any abnormal power dissipation in the system. See Figure 17. FOD detection works as following: The receiver measures voltage at Rectifier and LDO output and also measures the output current. Based on these values, it calculates the total received power, taking the losses of the receiver coil, resonance capacitors, rectifier stage and LDO into regard as well. The receiver then sends the total received power packet back to transmitter. The transmitter measures input voltage and current, and calculates the total transmitted power including losses in the MOSFET Bridge and transmitter coil and capacitors. It then compares the calculated transmitted power value the with the received power data from the receiver. If the difference between these two values is larger than the preset FOD threshold level, it will stop the transmission and signal an FOD fault. The power-loss of various power stages in the whole signal chain depend on the used power components and are highly non-linear. WPC1.1 certified transmitters and receivers such as Nokia DT601 and RT1650 EVB have well-tuned the power calculations to ensure accuracy FOD detection over the full load range. If the RT1650 is used in an end application with metal parts nearby, it may be necessary to re-tune the FOD settings in MTP memory to include the specific losses of the application and ensure correct FOD detection. The total system efficiency of the wireless power transfer application depends on the power loss in the various stages of the signal chain as described in the FOD section. Total system efficiency is measured by dividing receiver output power by transmitter input power at the DC input. Efficiency of WPC low power systems normally lies between 70% and 80%. Using high grade transmitter and receiver coils and capacitors can improve efficiency. The size, distance and alignment of the coils will also have influence. In the final application, the presence of other conducting materials like batteries and shielding will affect efficiency, as these will pick-up stray fields and to some extend behave like Foreign Objects. In the RT1650 receiver, the rectifier is fully synchronous to minimize rectifier losses. The LDO losses can be minimized by minimizing the LDO headroom. But care must be taken to allow sufficient headroom to maintain regulated output during load steps and other system transitions. Figure 18 shows system efficiency of the application example. The system efficiency and power loss curves show a typical switching power supply behavior : At lighter loads, switch losses dominate, while at higher loads, the conduction losses of power elements dominate. The LDO dynamic headroom control shows the increased power losses at low load due to extra headroom for load transients. At high loads, the LDO drop is minimized and even at 1A load current, LDO losses are only 250mW. Coil misalignment will reduce system efficiency due to worse coil coupling and increasing stray fields. With the Nokia DT601, receiver coil placement is quite critical, and large misalignment will lead to system shut-down & restart cycling. Placing conductive metal planes like PCB with ground-plane on top of the receiver coil will induce some eddy currents resulting in extra power losses. Due to the shielding of the receiver coil, this effect is relatively small and will normally not trigger FOD. Placing metal shields between transmitter and receiver coil will increase losses considerably and will trigger FOD. No metal shields should be placed between receiver and transmitter coils. Using a larger and higher quality receiver coil will improve system efficiency considerably in the high load range. But these coils use litz wire and have rigid ferrite shields, which may not be suitable for every application. The settings in the RT1650 MTP memory can be accessed via the I2C bus. The Richtek Sparrowboard or Wrenboard can be used as interface between PC and RT1650 EVB. In the firmware adjustment mode, a separate 7.5V supply should be connected to the RT1650 EVB rectifier voltage. The wireless transmitter should not be used in this mode. See Figure 20. 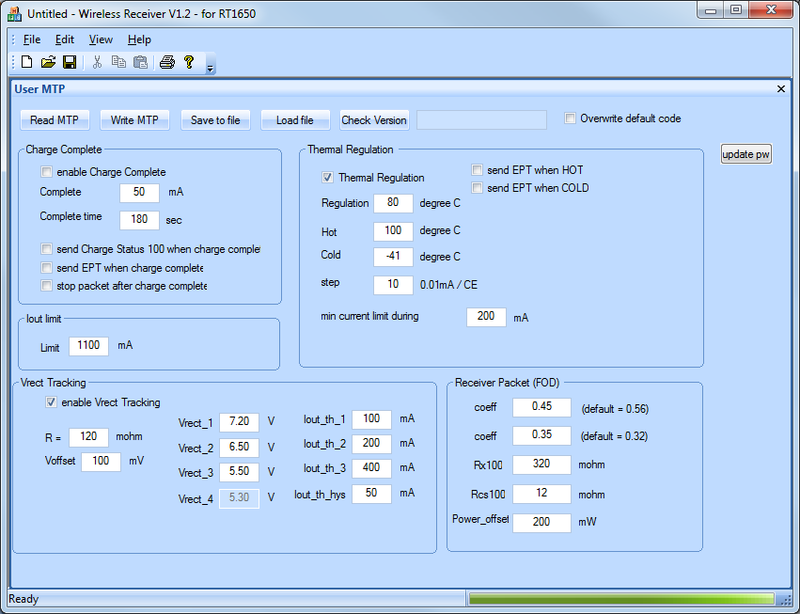 Figure 21 shows a screenshot of the RT1650 software tool. The tool enables the user to read the RT1650 MTP memory, and make changes to specific settings like Charge Complete action, IC thermal regulation, Maximum Current limit, Rectifier Voltage settings at different loads and Receiver FOD fine tuning. After making changes, the new settings can be written in the MTP memory. 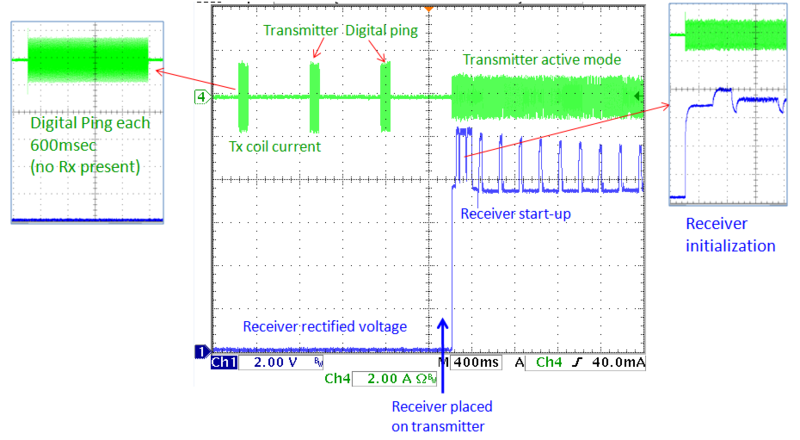 RT1650 makes the design of a wireless power receiver relatively easy and straight-forward. The application hardly requires any external components, and the configurable MTP memory makes it possible to fine-tune several parameters. The critical design components are the receiver coil and correct value of the resonance capacitors. 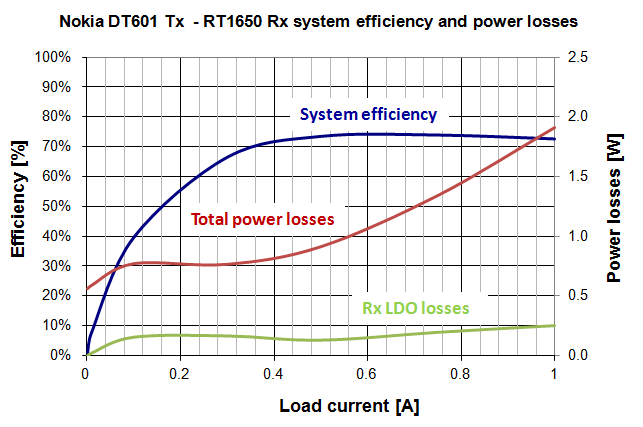 If the receiver load exhibits load transients, it is important to examine the power stage aspects of the total system, and dynamic rectifier settings may need to be changed to cope with open-loop behavior. 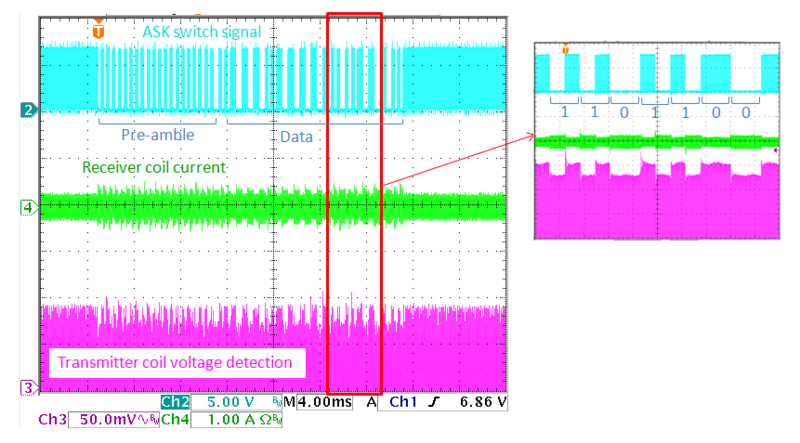 Be sure to check the LDO power loss after changing rectifier voltage settings, and IC layout should be optimized for IC cooling via PCB inner layers. The receiver application needs to be checked on the effects of metal shields and PCB ground planes nearby the receiver coil, and FOD settings could require some adjustment. For best efficiency, high quality receiver coil and resonance capacitors are required. For more information, please check additions documentation on the product page of RT1650.